LOWER EAST SIDE — Archaeologists have dug up a 19th-century recipe for fending off death. During a recent excavation beneath a hotel site at 50 Bowery, Chrysalis Archaeology discovered a tiny, greenish glass bottle that once contained the "Elixir of Long Life." 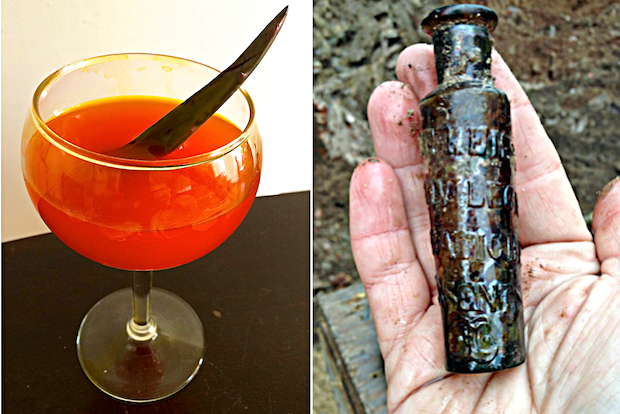 The bottle found amid a cache of 150-year-old liquor bottles beneath what was once a German beer garden sparked the archaeologists' curiosity, and they decided to hunt down the original recipe so they could try the elixir themselves. Loorya enlisted colleagues in Germany to help her track down the recipe in a 19th-century medical guide. After they translated it for her, she discovered it contained ingredients still used by modern-day herbalists: aloe, which is anti-inflammatory, and gentian root, which aids digestion. Mostly, though, the elixir was made of alcohol. Loorya and her team are gathering the ingredients for the elixir and plan to try making it within the next couple of weeks. They also plan to recreate Dr. Hostetters Stomach Bitters, a once-popular 19th-century medicine, after finding two of those bottles at the 50 Bowery site and seeking out that recipe as well. The Hostetters recipe is a bit more complex, containing Peruvian bark, also known as cinchona, which is used for its malaria-fighting properties and is still used to make bitters for cocktails, and gum kino, a kind of tree sap that is antibacterial. It also contains more common ingredients, including cinnamon and cardamom seeds, which are known to help prevent gas. When DNAinfo New York showed the recipes to herbalist Lata Kennedy, who's owned the East Village herb shop Flower Power for 19 years, she said many are still used to naturally treat ailments. Using alcohol to extract the beneficial properties of herbs and roots is still a common practice used by herbalists today, Kennedy said. She sells many of the ingredients used in the recipes, both in raw form and alcohol-based tinctures, and she believes they improve people's health — and could even prolong their life. Chris Marshall, a bartender at Apotheke in Chinatown, agrees. He specializes in creating cocktails inspired by the apothecaries of yore, and said the Dr. Hostetters recipe is not far off from some of the bar's own bitters blends — as well as those commonly used by liquor brands Aperol and Angostura. "With the rise in popularity of the cocktails in general, you’ve seen a resurgence in the use of bitters," Marshall said. "They add an interesting flavor to cocktails, but there’s a reason there’s a long history of these bitters — they’ve been used as digestives for centuries in countries around the world." Since Marshall started using bitters made from ingredients like orange peel and rhubarb, he has taken to using them for their original medicinal purposes, mixing them with soda water to drink before he eats a meal. “Most people probably like them in cocktails for the flavor, but I think there’s something to the digestive benefits,” Marshall said. Here are the two recipes Loorya's team discovered, with a couple of caveats. She's not sure how much people drank at a time, but the Elixir of Life bottle the archaeologists found could hold less than an ounce. Also, the quantities are approximate, and the raw ingredients can be substituted with either powdered or alcohol-based versions. Squeeze out the liquid from the aloe and set aside. Crush the rhubarb, gentian, zedoary and Spanish saffron (for a modern twist, use a blender for this part), and mix them with the aloe liquid, water and alcohol. Let the mixture sit for three days, shaking frequently. Then filter it using a cheesecloth or coffee filter, and serve. Be careful with the liquid — the saffron can dye your hands or other kitchen items. Mash together the gentian, orange peel, cinnamon, anise, coriander, cardamom and Peruvian bark. Mix the crushed ingredients with the gum kino and the alcohol. Let the mixture sit in a closed container for two weeks, shaking occasionally. Strain the mixture, add the sugar and water to the strained liquid and serve.